Lenovo dished out some fighting words to Microsoft, downplaying Surface as just one of many tablets it feels it can compete with. Speaking during Lenovo's first fiscal 2013 earnings call, CEO Yang Yuanqing said of Surface, "Although we don't like Microsoft providing hardware, for us, it just adds one more competitor." "[They're] just one of our many competitors. We are still confident that we are providing much better hardware than our competitors including Microsoft." "They are strong in software, but [we] don't believe they can provide the best hardware in the world. Lenovo can." Lenovo has reason to be confident, reporting in the same earnings call that the Chinese company reached $8 billion in sales for the quarter, a 35 percent increase over the same months last year. Those high sales translate to $141 million in net income earnings, a 30 percent increase from last year. Much of that success comes from overseas, with shipments in the Asia Pacific and Latin America regions growing by 59.2 percent in the quarter, 9 percent of which was from China alone. Asia comprised 21 percent of Lenovo's total sales for the quarter. North America, meanwhile, only accounted for 15 percent of Lenovo's worldwide sales. Lenovo now believes it obtained 15 percent of the PC hardware market share, closing in on its top rival Hewlett Packard with 15.7 percent. 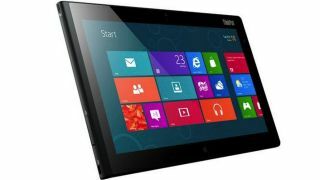 The firm is hoping to mirror its PC hardware success with tablets, launching the ThinkPad Tablet 2 for Windows 8 this October. "To be frank, we're not that worried about [Surface]," Yuanqing added during the earnings call. "Microsoft is still our strategy partner. We are very optimistic on the Windows 8 launch so we will fully leverage that to launch our new products. Rumors already suggest that Lenovo is working with Nvidia to develop a second Windows 8 tablet. The unnamed tablet is said to run Windows RT and will come with a flip-out keyboard similar to the Surface. See, Lenovo does have some nice things to say about the Surface. After all, imitation is the highest form of flattery.